Technotel's POP games measure just 2 1/2" X 4 1/2 " X 1/2" thick and thus are truly pocket size. Sky Invaders is a combination device which displays time, date, and month; sounds an alarm; and plays two games. It is the first game in the dual screen series which provides two entirely different images on the same 1 1/2" X 2" LCD display screen. Five buttons on the upper left of the unit select the mode of operation, turn the alarm on and off, and so on. Control of the games is by means of two larger soft-touch rubber buttons on each side of the screen for movement and a firing button on the right. In Game A, a squadron of enemy helicopters drops bombs on your piece of turf. Your job is to shoot down everything in the sky--helicopters, bombs, and jet planes. It's not easy; I rarely scored above 20 points. However, my son took it as a personal challenge to master the game and was soon scoring more than 100 points per game. In Game B, that same squadron of helicopters is dropping enemy paratroopers and supplies which you must capture with your truck convoy on the ground before they manage to intrude into your headquarters. For $29.95, Sky Invaders provides a great deal of fun and challenge, and is a real value with the watch and alarm thrown in. Batteries are included. Like the other POP games, Inferno is a combination timepiece, alarm and game unit. The unit is pocket size and has a 1 1/2" X 2" LCD display. Three buttons select the mode and set the time, alarm and date, while two larger buttons on each side of the screen are for control of the game. The object of Inferno is to maneuver the ladders on four fire engines to rescue people who are trying to escape from a burning building, and to keep balls of fire away from the gas tanks at the lower right of the screen. Successfully fighting a fire is worth 10 points while a rescue is worth only one point; it is wise to keep these priorities in mind while playing the game. If a fire ignites the gas tanks, you get an "error mark;" four errors end the game. However, at 200 and 500 points, all errors to date are annulled. Inferno has a retail price of $24.95 (including batteries) as do the other eight games in the series. Emergency is one of three new, compact pocket games which feature an AM radio in addition to the time, alarm, and game capabilities. It is just 1/2" longer than the other games, measuring 5" X 2 1/2". 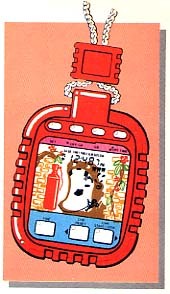 Other POP games with an AM radio include Voyager and Barrier. Emergency requires you to skillfully operate a robot on the ground to receive a superhero who, for some inexplicable reason, is dropping from a base overhead. Meanwhile, an enemy plane is attacking the robot and the foot of the base. Successfully receiving a superhero is worth one point while scaring the enemy plane away or shooting it down is worth 10 points. A successful mission by the enemy plane costs you an "error mark." After four such errors, the game ends. Like the other POP games, Emergency operates on two watch batteries (the radio requires two more) which are included with the game. Incidentally, the radio uses a small earphone; it does not have sufficient power to drive a speaker or Walkman-type headset. Price is $29.95. Masudaya has introduced nine Thumb Power "Play & Time" games. All are a compact 2 1/2" X 4 1/2" X 1/2" and fit easily in a pants or shirt pocket. Most of them have four functions: a watch which displays time of day, a stopwatch which times events to the nearest second (not good for running or swimming events), an alarm, and the game(s). 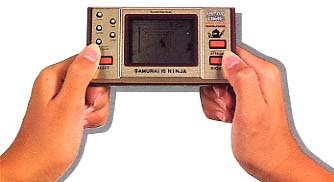 The time and the game are displayed in a 1 1/2" X 2" two-color LCD display. Watch-type batteries are included with all games. The display is in the center of the unit and the control buttons are on either side. The buttons are all soft-touch rubber; the game control buttons are large and the time buttons are smaller. Samurai vs. Ninja is a classic cat-and-mouse game. As the Samurai, you move on a horizontal platform across the center of the display. It is your job to keep a sacred scroll out of the clutches of the slippery Ninja spies lurking below the platform. As each spy comes into view beneath a hole, you must press your attack button and launch your spear at him. But beware: the royal princess is a captive of the Ninja and you may hit her by mistake if you are not careful. There are nine skill levels which afford varying amounts of time to score 30 points (20 to 60 seconds). If you score 30 or higher, you move on to Level B in which the wily Ninja attack from the ceiling. Tricky, these Japanese! This is definitely not an easy game to master, but who ever said the lot of a Samurai was an easy one? This game has the same four functions as the others in the Masudaya Thumb Power "Play & Time" series. The unit includes two games, Jungle Adventure and Woodman. In Jungle Adventure you are a jungle lad. A vine swings back and forth at the top of the display like a metronome. You start in a tree at the right, and must press the jump button to catch the swinging vine, swing over to the left, and jump off the vine to reach your true love who is being held captive by a nasty gorilla. After linking up with your girlfriend, you must again catch the vine and swing back to your tree on the right. Sound tricky? It is, but that's not all. As you are swinging, alligators may try to nip you as you swing by and the gorilla may try to prevent you from jumping off the vine. Yes, you have a mallet to hit your adversaries, but you must be quick on the control buttons to survive. Sound effects? You bet. A beep when you hit the gorilla. A boop when you fall, and a short tune when you rescue your lady fair. The game lasts three minutes, after which your score is displayed at the bottom of the screen. Two minutes is all you get in Woodman, the second game on the unit. In Woodman, your job is to chop down trees in the jungle. Three strokes of the axe fell a tree, but a pesky lion rarely lets you get three strokes in a row. If you don't want to start over each time, your only recourse is to hop up in the tree when you see (or sense) the lion coming, and hop down as soon as he turns his back and continue to chop. Woodman is not as much fun (or as challenging) as Jungle Adventure, but is a nice bonus on the game unit. Thumb Power games are priced in the $25-$39 range including batteries--not bad for one or two games, a watch, alarm, and elapsed timer all in one compact unit. Nintendo has had four single screen pocket games on the market for about a year. However, they have now introduced a line of multi-screen games. Given the immense popularity of Donkey Kong in arcade and home video versions, we think it will be the most popular one of this new handheld series. The game is slightly larger and heavier than other pocket games; the case measures 3" X 4 1/2" X 1" and has an attractive brushed brass top. 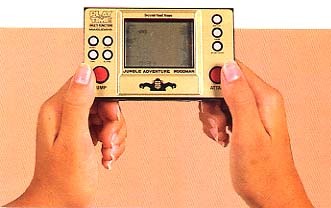 The game hinges open to reveal two 1 1/2" X 2" LCD screens. A red and blue overlay gives the impression of a colored screen. 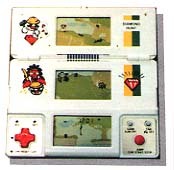 To the right of the bottom screen are three game select buttons and a larger "jump" button. To the left is a "plus" controller which has the same function as a four-directional joystick. The unit has a 24-hour time and alarm function; the time is displayed in the lower right corner. The game has the same scenario as its big brother in the arcade, but a rather different method of play. Kong has captured the beautiful maiden and the hapless Mario must climb the girders to the top of the building to rescue her. Unlike the arcade version, Mario cannot jump the rolling barrels while he is running. Instead, he must stop in a place with no girders overhead and wait there, jumping barrels, until it is safe to move further along the beam. Complicating Mario's mission on the lower screen is an overhead conveyer belt with moving girders; hitting one of these is just as lethal as hitting a fixed girder. 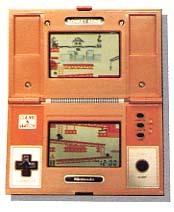 On the top screen, Mario must trip a switch on the left which activates a crane on the right. When he reaches the crane, he must grab the swinging hook which lifts him up to where he can cut one of the cables holding the topmost girder on which Kong is prancing. Mario is then returned to the bottom where he starts again on his perilous mission. After four cables are cut, Kong plummets to his death. But not for long--a new Kong quickly replaces him, and the game continues. Mario gets 1 point for jumping a barrel on the lowest level, 2 points for one on the next level, and 5 to 20 points for cutting a support cable depending upon how long it took him to get up to the top. You start with three Marios. At 300 points, you are awarded an extra Mario. The maximum score that can be displayed is 999. Sorry to say, Donkey Kong did not get rave reviews from our teenage playtesters. Although the B level of play is faster than A, they felt the game was a bit tame since Mario cannot jump while running along. On the other hand, some of the other playtesters felt that it offered more than enough challenge. The package includes the game, two watch batteries, 90-day warranty card, two caution notices, and two red stickers to place over the battery compartment "to prevent babies from removing and eating battery." Thanks, Nintendo. V Tech (Video Technology) has introduced a wide array of Time & Fun pocket games ranging from ones that look like oversize pocket watches to the tri-screen series. The tri-screen games measure 3 1/4" X 4 3/4" X 5/8" when closed and open out to 5" X 4 3/4". Each of the three screens measures 1" X 1 3/4". Each of the screens has a different game which can be played individually or as a continuous series. To the left of the bottom screen is a "cross" controller which functions as a four-directional joystick. To the right is a jump button and two smaller game/time select buttons. In Diamond Hunt game A (bottom screen), a crazed elephant in the middle screen throws rocks down to the lower screen. You must run from right to left, grab a swinging vine to cross a chasm, and jump rocks when they roll in your path. In the middle screen, you must continue to avoid the rocks as well as electric spells being cast by three angry witch doctors, and finally get by a hungry lion who would like nothing better than a plump diamond hunter for lunch. The top screen is really hairy. You must jump over slithering, poisonous snakes. You can also kill them with a magic axe (5 points each vs. only 2 points for jumping a snake), but you cannot move forward toward the diamond (50 points) while you have the axe. You have three diamond hunters in each game. Maximum score is 9999 (ha, ha). The time and alarm functions are more extensive than most other pocket games. They include time in two time zones, alarm, date, and stopwatch. Two watch batteries are included. Suggested list price is $29.95. Pancake is one of four compact pocket games, each with a 1.7" X 1.3" screen. Pancake uses just two directional buttons for right and left movement of a waiter. Two other games in the series, Monkey and Banana, have four directional control buttons. It is the task of the waiter to catch pancakes being tossed about by an overly enthusiastic chef (at the right), and then deliver them to a customer seated at the left. Actually, the waiter doesn't exactly catch the pancakes; rather, he bounces them on his tray like a juggler. The game is easy at first, but becomes more difficult as the chef launches more and more pancakes simultaneously. Five misses and the game ends. We found this one of the easier and less frustrating pocket games to play although we can't imagine anyone approaching the maximum score of 9999. As with the other V Tech Time & Fun games, this provides time in two time zones, an alarm, stopwatch (to 1/10 sec), and date. It's a good buy for $19.95. 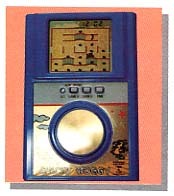 The Mini Time & Fun series of games have a slightly smaller screen (1" X 1.4") and sell for a few dollars less ($16.95). Tennis and Hot Line with just two movement buttons are relatively easy to play whereas Bomb Fight and Hippo Teeth are somewhat more difficult. The Arcade Time & Fun games are somewhat larger (4 1/2" x 3" x 3/8") and have a large 1.2" diameter disk which provides four-directional movement control. Playability of the two Arcade Time & Fun games, Chicky Woggy and Monkey Jump, was excellent. Monkey Jump has a theme similar to Donkey Kong, while Chicky Woggy is a Pac-creature type of game but instead of eating dots, chicky woggy lays eggs. She is pursued by wolves, but can eat magic snakes to give her temporary power over the wolves. Lots of fun for $19.95. The four games in the Sporty series are in the shape of a large (2" X 2 1/2" X 1/2") pocketwatch on a heavy nylon cord. The screen is a smallish 0.8" X 1". The games are the same as in the Mini Time & Fun series; we tried Hippo Teeth. In Hippo Teeth, nasty cavities are attacking the hippo's teeth. We would like to thank V Tech for showing us what a cavity looks like; it is a really evil looking creature. The hippo obligingly keeps his mouth open so you, having shrunk considerably, can take your hose and wash off those nasty cavities. Good clean fun for $16.95. Included are the same time functions as the other Time & Fun products.